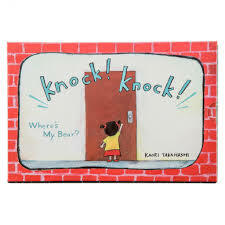 Kids' Book Review: Review: Knock! Knock! Where's My Bear? Review: Knock! Knock! Where's My Bear? Here’s one out of the box - literally! Contained in a slipcase, this book is visually entertaining and highly original. I have never seen another like it. Fully illustrated cardboard pages fold out in a zigzag fashion to show and tell the story, leaf by leaf. Full colour on one side, black and white on the other, each image shows a different view of the story’s progression. The girl child lives in an apartment block. Having left her teddy bear somewhere unknown, she sets out to find it. She climbs the staircase, knocking on every door to enquire. Surprisingly, an amazing adventure opens up for her. She meets new, strange, and incredible people. She discovers natural surroundings behind closed doors. Amongst them is a forest filled with animals, and trees growing in a room like a garden. She uncovers an aquarium, a library, and a school room. Unexpected events occur. By the time she reaches the top, she has learnt many things about the diversity of the residents and their apartments. But does she find her teddy? This is an ideal gift and terrific a learning tool. The pictures will encourage the use of language through discussion, questions and answers. Beautifully designed and delivered, the uniqueness of this publication will enthral children and adults. Prize-winning Tara Books are translated into many languages. They publish books for children and adults. I encourage booklovers of all kinds who admire and search for something singular in books, to examine this site for a visual/artistic experience. The titles are distributed through Thames and Hudson, recognized for representing the highest quality in books. Title: Knock! Knock! Where’s My Bear?